Add support for Raspberry Pi encoding/decoding. This change adds support for hardware-accelerated encoding and decoding on the Raspberry Pi. I tested with a Raspberry Pi 3, but I believe the Raspberry Pi 2 also includes a similar SoC and should work. In my testing, using the h264_mmal decoder results in about 50-75% less CPU usage over libx264 with a few tweaks (I'll write up more in the forums for getting the most out of your Pi). The Raspberry Pi 3 includes Broadcom SoC which supports hardware-accelerated encoding and decoding through the mmal (decoding) and openMAX (encoding) codecs via the VideoCore GPU. FFMPEG fully supports these codecs as hardware acceleration methods. 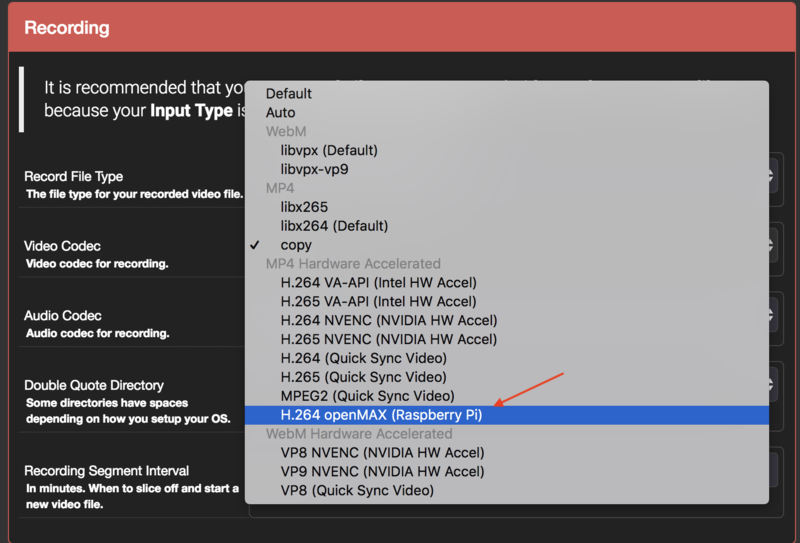 You can now set the hardware acceleration code to h264_mmal, and h264_omx is a supported option for streaming and recording.